Builds academic skills – These crafts for kids build math skills by reinforcing children’s knowledge of numbers, colors, and patterns. Just match the colors to the numbers for a beautiful mosaic! Enhances hand-eye coordination – Eye-hand coordination is one of the fine motor skills that's important for academic and life success. Children build and enhance their abilities while having fun creating mosaic patterns! Virtually no setup & cleanup time – No special knowledge or preparation is needed. All children need is a clean surface on which to work on their mosaics. Reasonably priced – Sticky Mosaics are moderately priced and approximately four designs come in each box, which makes them very affordable. 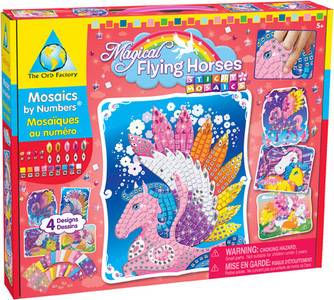 Theme variety – Kids have different interests, so we carry mosaic patterns for kids in a variety of themes - magical flying horses, pirates, robots, and more! Makes a memory to keep – Kids love to give their creations to people they love. These art and craft kits for kids build self-confidence and provide loved ones with a keepsake forever! Builds conversational and emotional Skills – Start a conversation about the mosaic patterns to demonstrate your interest in the child. It'll be enjoyable and can increase confidence and emotional security. 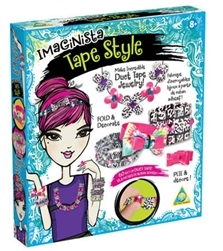 One-of-a-kind craft kits for kids make great gifts – The Orb Factory’s Sticky Mosaics funky notes and sparkling pen, duct tape jewelry, and curiosity kits pulsar powerballs also make wonderful Christmas gifts or birthday presents for kids because they are not easily found in large chain stores. Thus, the gift is likely to stand out among other presents. 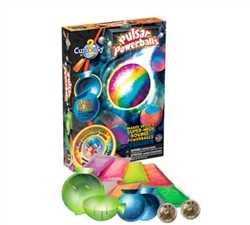 Duct tape craft kits and the pulsar powerballs are very popular with school-age kids and tweens! Easy to start and stop – The multiple smaller projects included in each kid’s art and craft kit make it easy for them to begin and end work one quickly and easily without the hassle of a long setup or cleanup process. Lightweight to mail/Simple to buy – The Sticky Mosaics box gives it the appearance of a big gift, yet these mosaics for kids are light and inexpensive to mail. 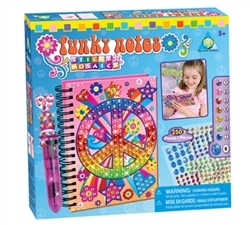 Finding mosaic patterns for kids is fast and easy at JumpStart Toys. Items are shipped within 24 hours, so that means a great gift for kids is just a few clicks away! 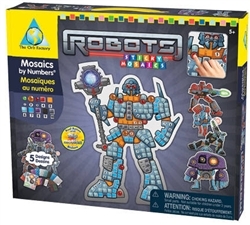 To view available Orb Factory Sticky Mosaic designs, visit http://www.jumpstarttoys.com/Mosaic-for-Kids-s/1889.htm today!